It is the blog post that you have all been waiting for. 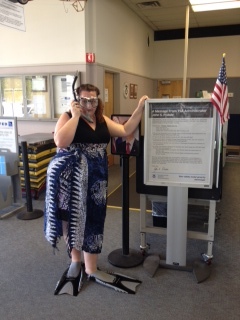 A recap of my 2014 GISHWHES adventure!! Okay, so maybe you have not been waiting for it, but it is my favorite post to write about. So here it goes. If you are not familiar with GISHWHES, you have not been reading my blog long, or not been paying attention. GISHWHES is the Greatest International Scavenger Hunt the World Has Ever Seen. (For more information go to http://www.GISHWHES.com or you can find GISHWHES on both Facebook and Twitter) Basically it is a week-long hunt for items that cause you to create, step out of your comfort zone and do random acts of kindness. This is the second years that I participated. 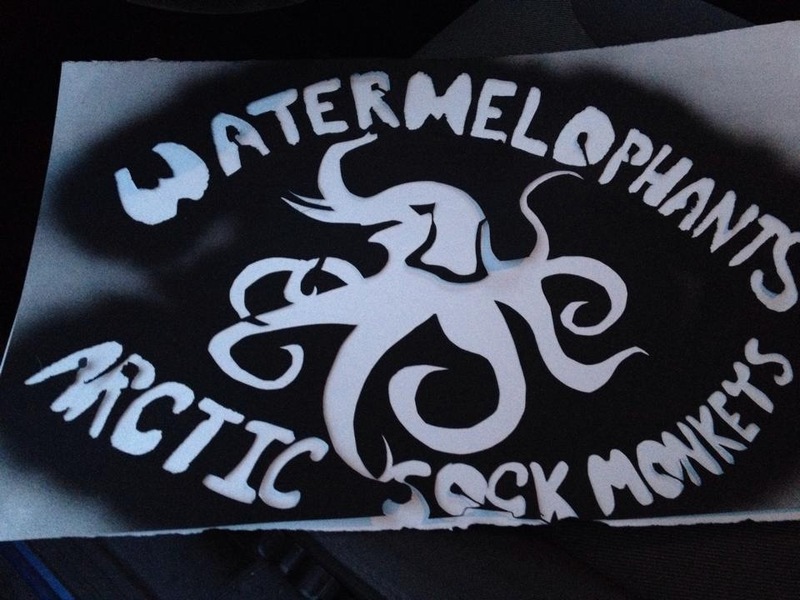 After having just a small group locally, my litte team- The WaterMelophants, consisting of myself, my sister and Niece #1, recruited several other people locally. We got a couple of friends from hockey (Ben & Jeremy) on board. One of my husband’s friends (He really is my friend too! )- Critter, had helped us out last year, so we pulled him into the insanity. Critter then convinced his neighbors (Cyndi & Jane) to join in. They in turn brough in another local friend (Deming) and a friend from the UK (Becki). So we were pretty set going into it this years with a local plus one team of 10. Item #69: IMAGE (one image with 15 images edited into it). An image of each of the members of your team in Brady-Bunch style grid format. Photos should be mug-shot style with each team member holding a black and white sign stating their city and country of residence. My local team made a plan to meet up at a local pizza place to go over the list. So Saturday August 2 at 11 am (PST) came and the list was release. This year the list began with 185 items. A bunch more than last year. And as expected, the feeling of being completely overwhelmed set in. Yes, I know that you have heard me gush about GISHWHES before. I am not going to lie. I loved it last year and I loved it this year. The difference this year was that year of experience. But it is also difficult to share that wisdom gained with someone who is new to the hunt. The feeling of being overwhelmed goes quickly to that of superiority. You can do the entire list on your own. So I will tell you that our local team meeting consisted of a lot of that outlook. And you cannot be the person that tells the new GISHER that they shouldn’t try to do too much. It can be stressful. So my sister and I committed to the tasks that we knew that we could do an kept a list of the possibly ones. The meeting ended and the first of many trips to the Dollar Store ensued. The hunt had begun. Item 130- IMAGE. 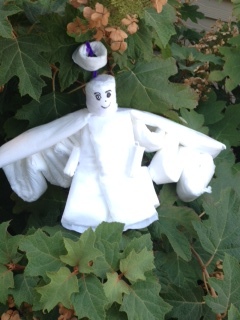 An angel made from feminine hygiene products. Last year I mentioned several things that I learned as being part of GISHWHES. And this year is no different. Lesson 1- As I mentioned last year, saying “Thank You” goes a long way. This is still the case. Be grateful. It is really that simple. You ask a lot of your friends and family while doing GISHWHES, and letting them know that you appreciate them it kind of a big deal. Lesson 2- Facebook does not always let you down. I recently discussed my disenchantment of FB. Well, this year FB came through for me. I posted several outrageous requests; i.e.- needing a Flash costume, needing a potato cannon, needed a fish costume. And this year, I got responses. We never did get the Flash costume, but I did find a potato cannon. My friend Lesley was the hero of the week for me by letting us borrow her snorkel costume and by literally whipping up both a fish costume and a geisha costume. Lesley is truly an amazing person and I could not be more grateful to her for help. Item # 106- IMAGE. 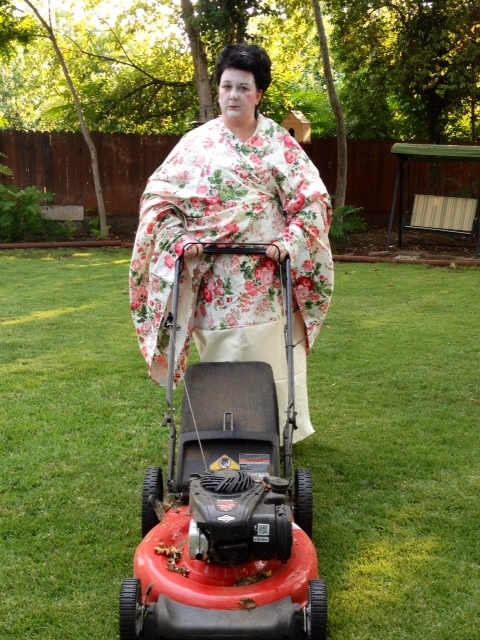 Let’s see a fully dressed, face-painted geisha mowing the lawn. 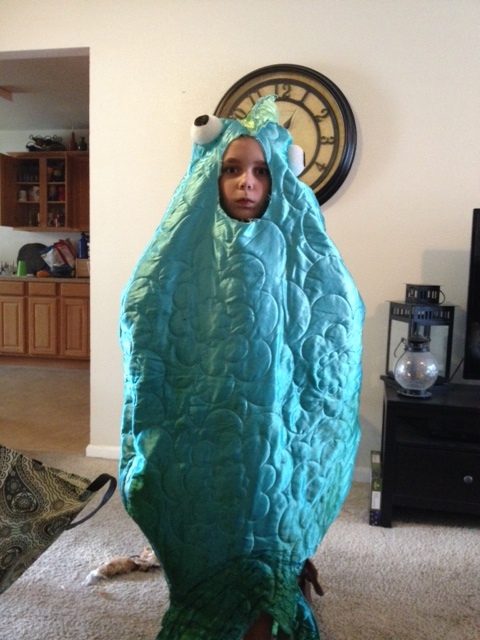 The awesome Fish costume my friend Lesley made! The other thing that has redeemed FB is that our team created a secret group and communicated mainly through this group. Niece #1 is not on FB so she was a little left out. And at my request, we tried to use an alternative method of communicating through Google + but that was a grand failure. And I have learned that I am not a fan of the Google apps. Lesson 3- Don’t doubt yourself. This lesson I actually learned upon received the 2013 GISHWHES yearbook. It showcases the work of other teams. One things that the yearbook does is basically shows you that you could have completed items that you did not think that you could. And it shows that people of all shapes & sizes have the confidence to put themselves out there. So there is absolutely NO reason why I couldn’t do the same. Sure there were things that I was still a little self conscious about but the inhibititions had decreased. Seriously, the worst that can happen is people will look at you like you are a weirdo or tell you “no.” So what! Lesson 4- I am not in my 20’s anymore! Yes, I know what you are thinking. That is not an epiphany, Jenn! And it is not but what I was reminded of is that there are two sides to this thought. There are some things that I just physically can no longer do without repercussions. I cannot stay out all night and survive on coffee anymore. I need my sleep. I make no apologies for this. You like me better when I have had my sleep. Making a total fool of yourself in public at 41 is a little different from doing it at 22. On the flip-side, I have the wisdom of being in my 40’s now. I know that you can’t commit to do every task on the list. The little petty bickering is not as likely to happen. You know how to ask for help, because of the years you have been on this earth. And I will tell you that it is a little sad that I am not longer in my 20’s from time to time, but honestly I prefer being in my 40’s. So that was a nice hidden reminder. Lesson 5- Everyone brings something to the table. Item #83- IMAGE. The writers and producers of the TV series, “Supernatural”, sometimes pretend they don’t like the limelight. Of course this is false-modesty. 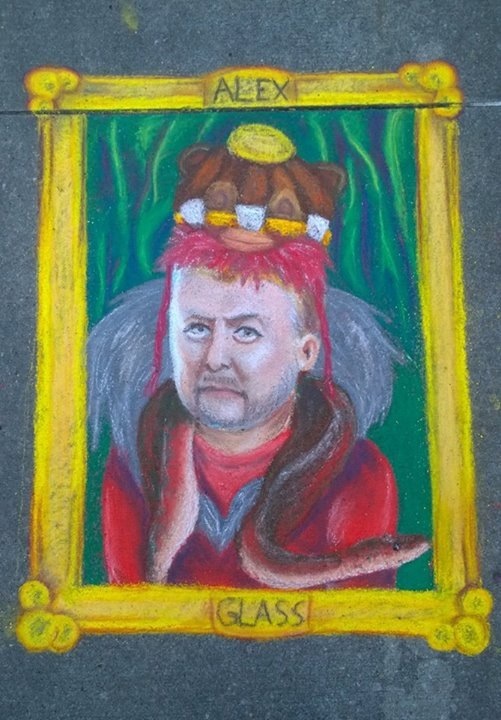 Immortalize one of them with a stately portrait done in sidewalk chalk art. Item #162- IMAGE. 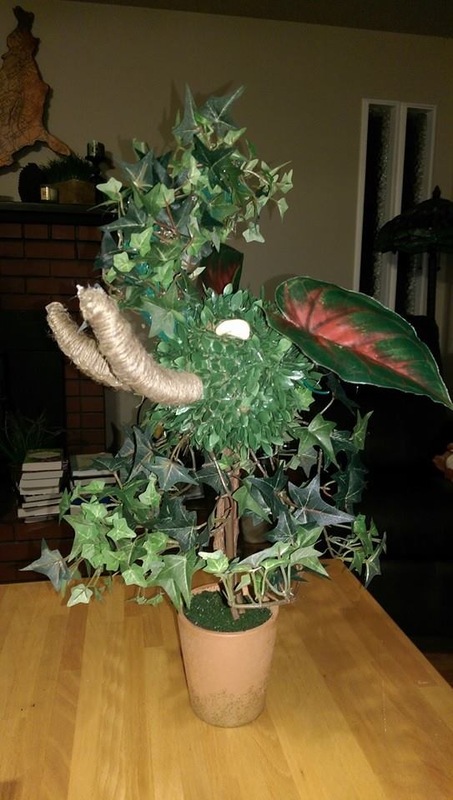 This or any past year’s GISHWHES mascot recognizable in topiary. Brilliantly done by my teammate Ben Seipel. I appreciate that I learn these lessons every year. I also like that I find a little more in myself by doing this seemingly silly scavenger hunt. I started participating in GISHWHES last year as a way to push myself out of my comfort zone. And it definitely does that. Yep, kids, that is me! My suggestion made the list. [On a side note, the original list has my last name misspelled. It is a common mistake. I let them know but I accept the fame anyway.] So of course our team had to complete this item. But as I mentioned earlier, I am not all that artistic. 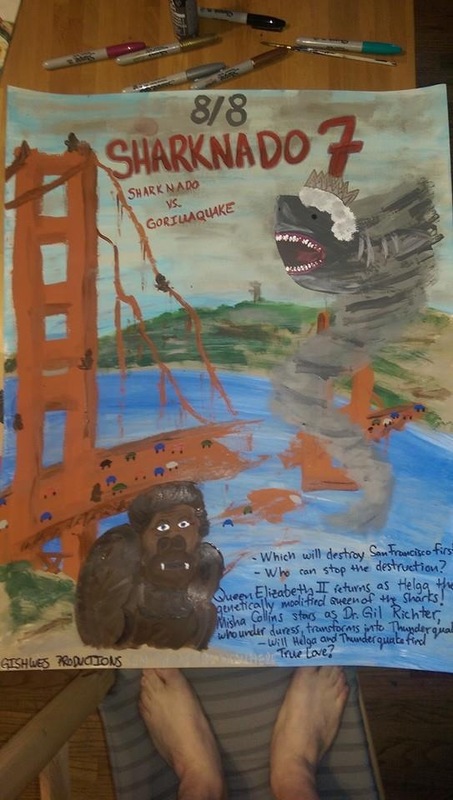 Thankfully my friend Ben painted the most amazing poster for this item. As you can see from the picture below, it is so incredible! And I point out that Ben originally told the rest of the team that he does have many talents. Again, I tell him that he is a LIAR! Dr. Ben, I thought you were pretty cool before all this, after seeing your hidden talents, you are one of the coolest people I know. Thanks Ben for making my suggestion come to life! That beautiful poster is now hanging in the office at my house. And it makes me smile every time I look at it. The other cool thing that was different this year occurred after the hunt ended. There was a call for people to apply to be a FEGVEP (First Ever GISHWHES Volunteer Program) member. And what these people got to do was review some of the completed items to see what images will make the annual GISHWHES yearbook. So, as you can imagine, I jumped on that. And I am happy to report that my application was accepted. As of the writing of this blog, I have reviewed 5 different items. And I love it. I want to do this all the time. It has truly been the most fun to see what other people have done. And again be shown that I could have probably completed some of these tasks also. My sister also was accepted to be a FEGVEP reviewer and has gotten to review 3 different video tasks. This year by the end of the hunt, there ended up being 197 tasks. At the last count it is estimated that our team completed right around 95 of those items. But some of them were spectacular. My sister, Niece #1 and I completed or participated in 25 of those items. Not as many as last year, but the whole experience was much better and much more organized. Niece #1 was pretty busy the same week of the hunt, so we will attribute some of that to her non-availability. Item #34- IMAGE. Well done! 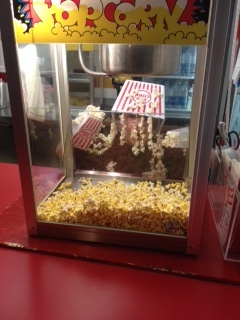 You’ve just managed to catch a rare “Popcorn Child Monster” on camera. So I come away again from GISHWHES with a little more confidence than I had when I started. I come away with several new friends. And I come away with some awesome new artwork for my office. I also came away with the now annual experience of purchasing mass quantities of feminine hygiene products from the Dollar Store. I come away being certified in CPR. I come away with some quality time spent with my family. I also came away a little tired but that I planned for by taking some time off work. But more importantly, I come away happy and feeling like a better person than before I started. I truly love the GISHWHES experience. And I am counting down until next year. So on that- go out and give something back! Be different! It will do you good. Item #29- IMAGE. If you’re like me, you’re sick of the go-to barista foam-art. If I have to sip at another latte adorned with a fern or clover shape, I’m going to cry. 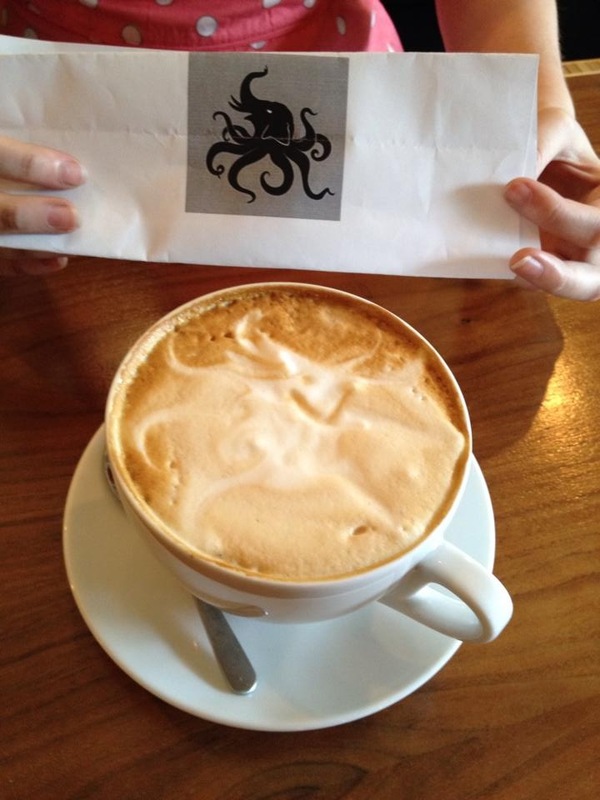 Let’s see the Elopus professionally recreated in the foam of a café’s hot drink. We create, therefore, we live.